"I love the unique and delicate flavor of truffles. This recipe highlights the truffle flavor in a creamy texture spread. The appetizer will fill your home with a lovely aroma and presents well on a platter. Mushroom lovers beware! This appetizer spread can be made ahead and stored in the fridge until you are ready to for your guests." Heat 2 tablespoons truffle-infused oil in a skillet over medium heat; cook and stir mushrooms until most of the liquid has evaporated, about 5 minutes. Add red bell pepper, parsley, and garlic to mushrooms; cook and stir until mushrooms are golden and lightly browned, about 5 minutes more. Remove skillet from heat. Stir remaining truffle-infused oil and cream cheese into mushroom mixture until cheese melts from the heat of the skillet; season with salt and pepper. 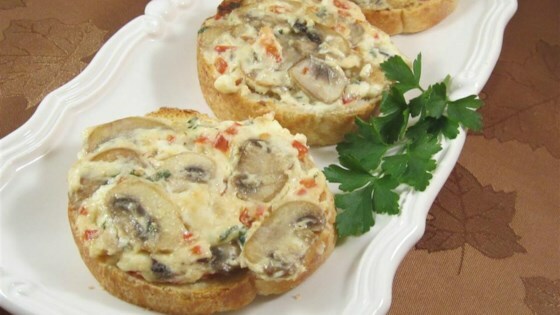 Spread mushroom-cheese mixture onto each baguette round. Arrange rounds on a baking sheet. Broil bruschetta until bread is warmed, 2 to 3 minutes. See how to make little appetizer toasts with peach and burrata cheese.